This is a new thing to can for me. Normally I don’t buy alot of extra oranges but there was a 25 pound bag on sale from my co-op last month for only $10 so I figured I’d get them and figure out what to do with them. The problem with buying super fresh produce is that it tends to go bad fast so even though the hubby has been eating them. So I needed to figure out something new to do with them. I’ve recently been reading Putting Food By. It’s got alot of ideas to can things that I didn’t think about before so I looked up oranges. It said to can them just like any other fruit. So I made a batch of very light syrup today and got these canned up! For us, I used pint size jars. If you have a bigger family and go through alot of oranges in one sitting you may want to use quarts. Also I use turbinado sugar to make my syrup. 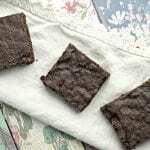 It has a slightly more brown sugar taste for the finished product but nothing major. If you want to use regular sugar that’s totally fine. You don’t even have to use sugar if you don’t want to! 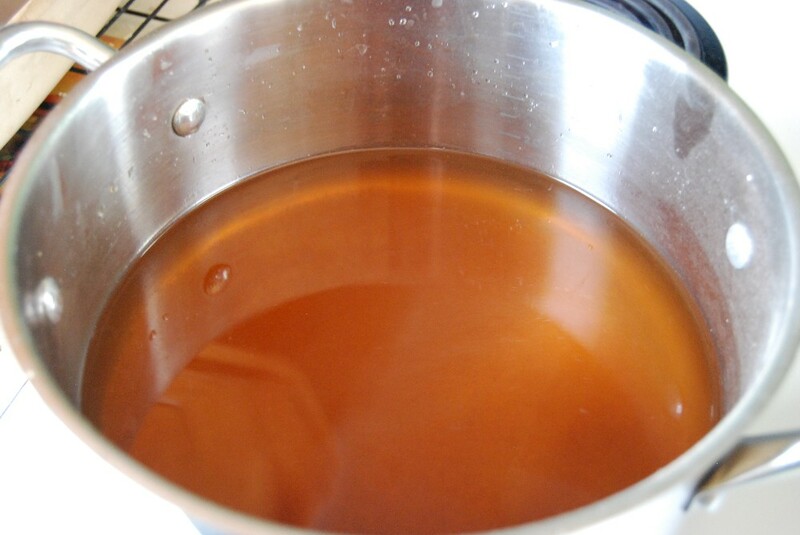 For a very light syrup, boil 5 1/2 c. water and 1 1/4 c. sugar. Simmer until the sugar has dissolved. Keep this warm until you are ready to pack your cans. Just one batch of this was enough for all 7 pints I did. Make sure the oranges you are using are fresh. The hard or moldy ones are too difficult to peel. If you bought them from the store or anywhere they might have been sprayed, make sure you wash them in produce wash first. I used no-spray oranges. 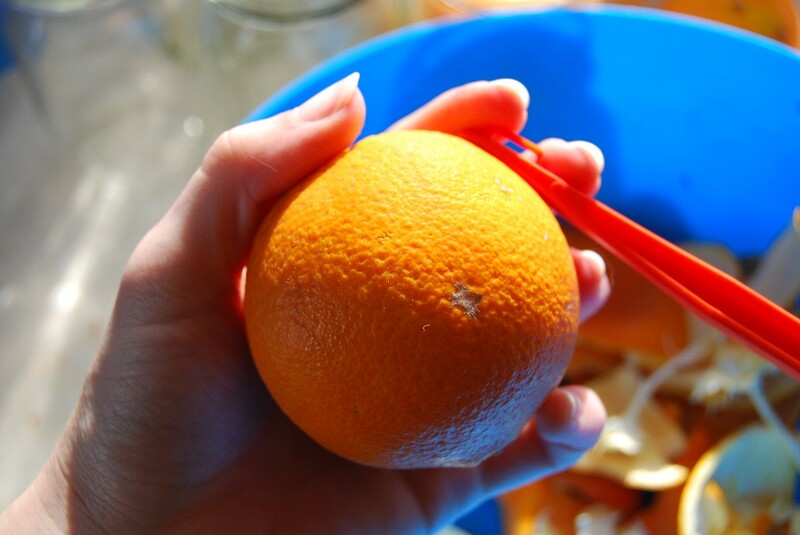 Peel the oranges with a citrus peeler. Try and get as much of the membrane or “white stuff” off as you can. Then separate into slices. Pack your jar with the slices tightly but leave about 1 inch of headspace. Looking down into the jar. Not sure why I took this picture…. 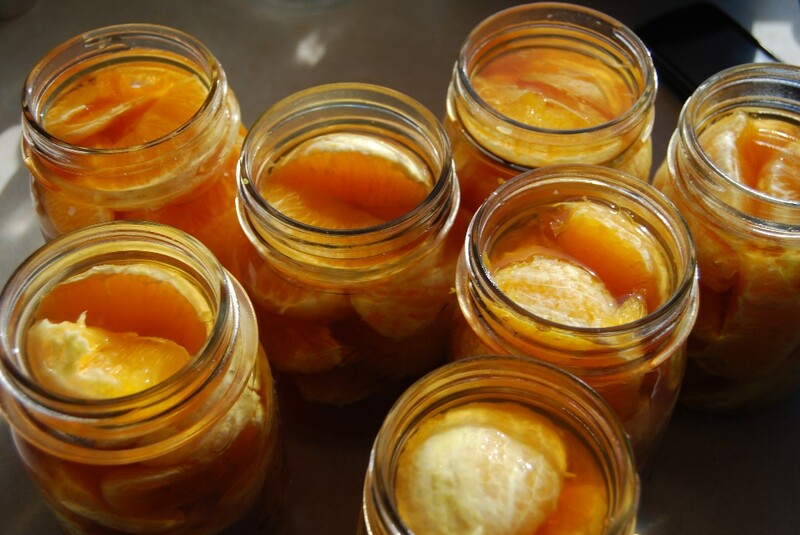 Once the jars have been packed with oranges, fill them until the oranges are covered with the light syrup we made earlier. Make sure you still leave about 1/2 inch headspace after the syrup is added. Clean off the rim of the jar well before adding the lid. I wipe them once with a wet rag and then again with a dry one. You don’t want any stick spots or water left on the rim of the jar or it won’t seal properly. Add the lids and then the rims. Make sure you screw the rims on tight! Preheat the water before you add the jars. You want it just simmering. Add all the jars to the water. 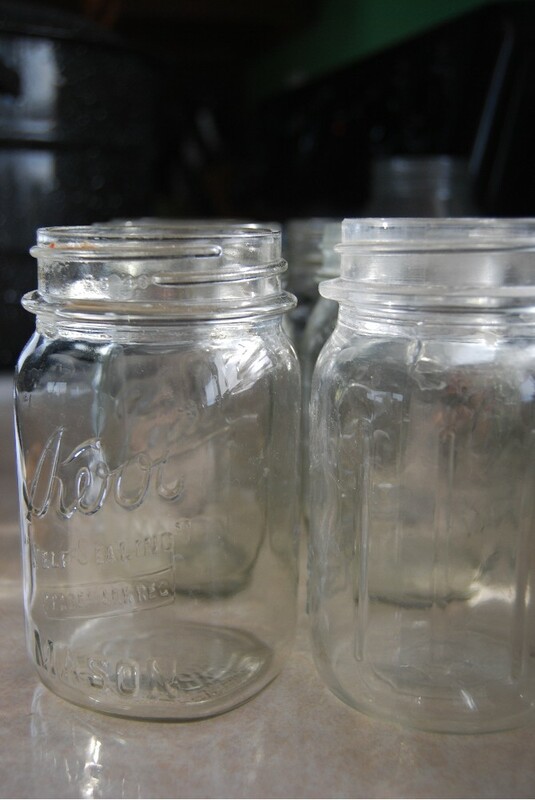 Make sure the water covers the tops of the jars. If it doesn’t, add a little more. Simmer/low boil these jars for 15 minutes. 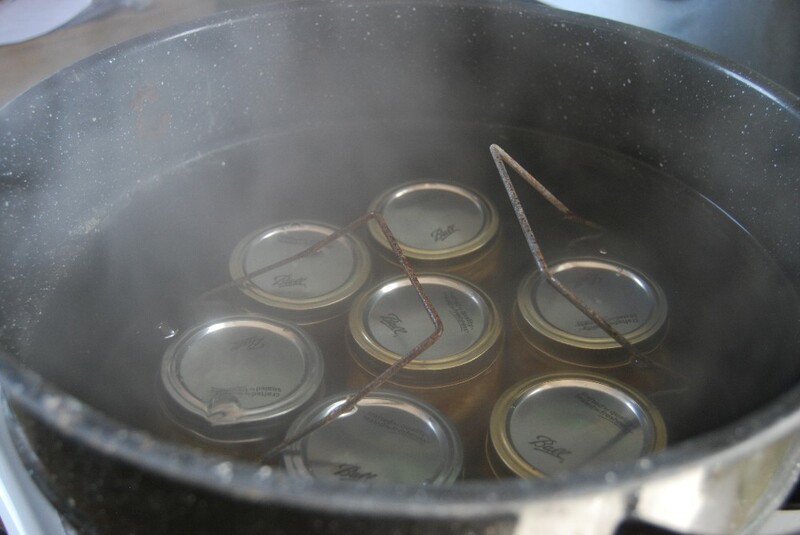 After 15 minutes, turn off the stove and let the water cool down slowly before you take the jars out. 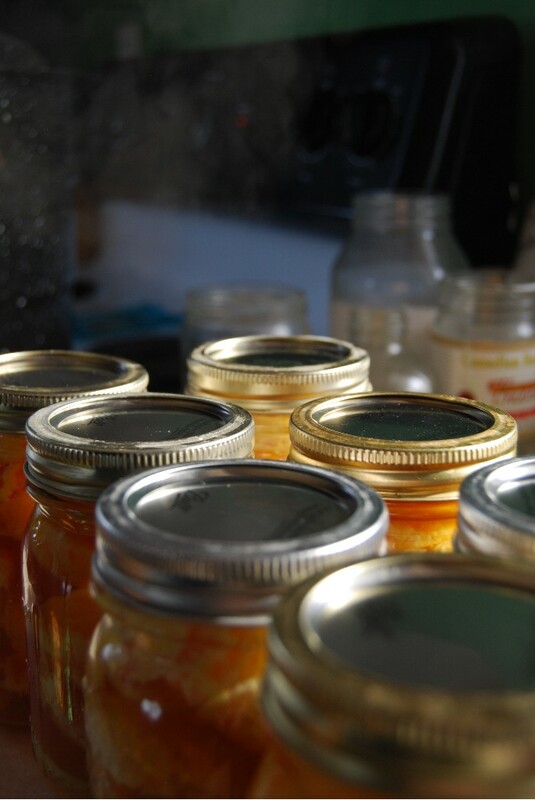 Once you remove the jars, put them on a cutting board or another heat-resistant surface. I use old flour sack rags to cover the counter so I can set them down and soak up the water that drips off. Do not touch the jars until they have sealed. You will know this by the “pop” they make and the lid will have an indent in it instead of being puffed out. Leave the jars alone for several hours. If some of the jars didn’t seal, either put them in the fridge and eat or you can replace the lid and try and re-bath them to get them to seal. 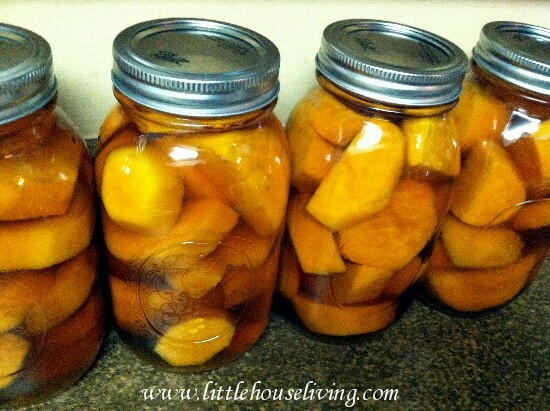 —Want to freeze them instead of canning? 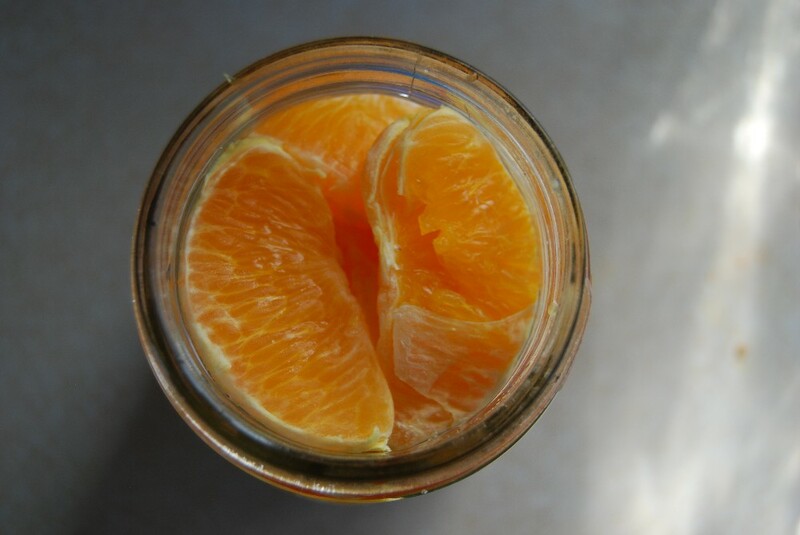 Here’s my tutorial on Preserving Orange Juice. Please check with your local extension office for any changes on times/temps/high altitude or check here. 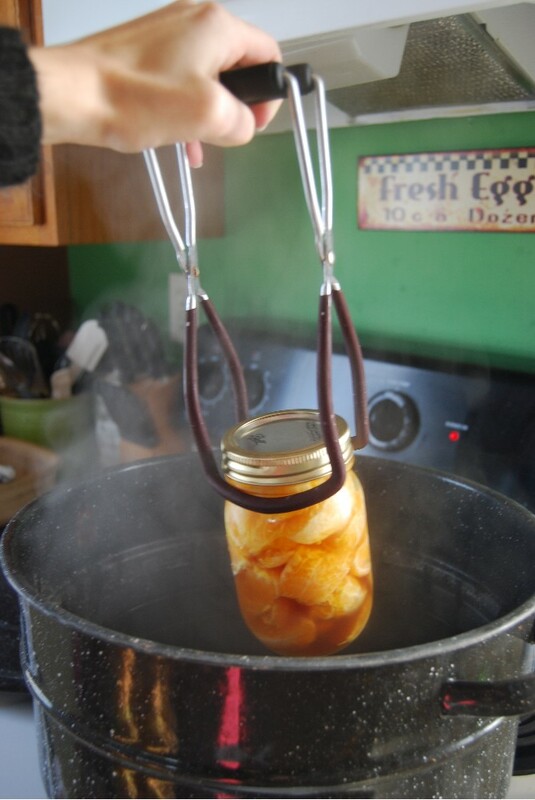 We actually tried canning clementines in January and it went really well! 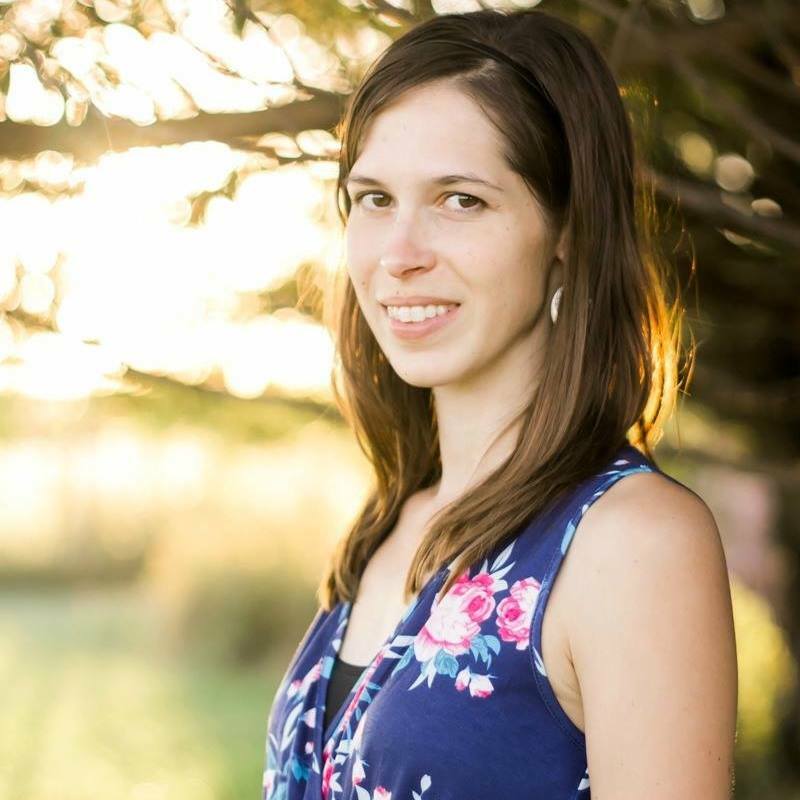 Here’s a link to our post about it. One side note — you can can with a light syrup as you did, or use water, or you can use orange juice! We went with the 3rd option and were very pleased with the results. huh! I didn’t know you could do that! How do they taste? Still nummy? Very informative and simple to follow directions!! Thanks a bunch! The hubby just suggested that same thing tonight. I guess I will have to try that next! can u use something other then sugar? honey or other sweetner? You could try it with honey or an acidic juice like orange juice or pineapple juice. Here is a way to easily peel grapefruit. I bet it would work with oranges if you used less time. Bake the whole grapefruit on a cookies sheet on 350 degrees for 15 mins. The peel comes off super easy and the white part doesn’t stick to the fruit. I peeled mine while they were still warm. 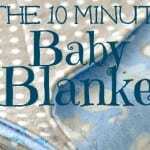 Use a pot holder to handle them when they first come out of the oven. Thanks for the canning instructions for oranges. And how do they taste? I love fresh citrus, so I’m curious to what they taste like! 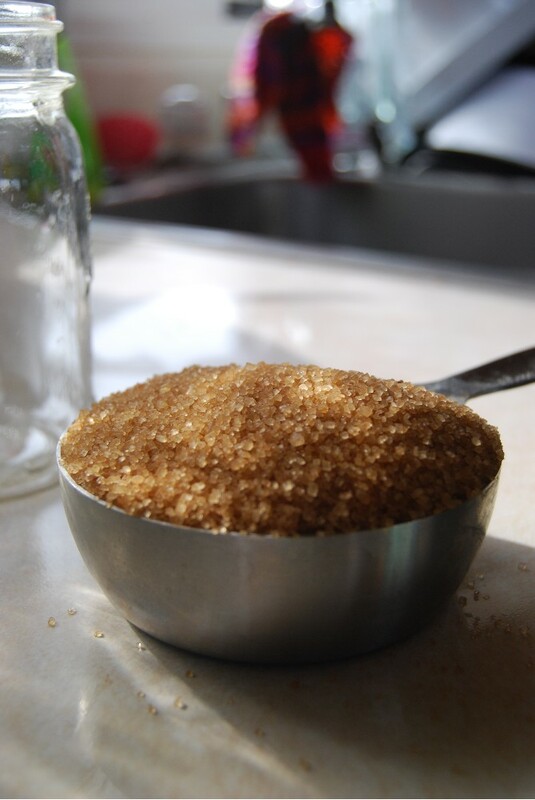 Have you used the turbinada sugar for canning anything other than oranges? I would like to know if it would work for applebutter or peach jam? Yes, I use it for any canning recipe that calls for sugar! I’ve used it in all my jams and when canning other fruits. Did you candy the orange peels? Thats another way to makebthe fruit go even farther. Basically you boil the peels, drain, repeat, simmer in sugar syrup, then roll in granulated sugar. There are tons of recipes online for it. You can do it with grapefruit peels as well. 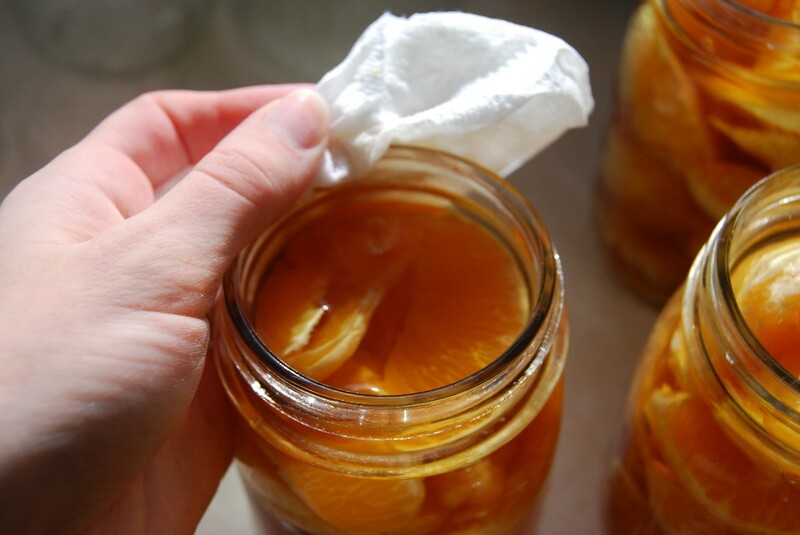 Also, we make a basic orange cleaner with our citrus peels. I put them packed tightly in a quart jar and pour white vinegar over them just to cover them, put a lid on top and stick it in a cabinet for about a month or two, just until the orange/citrus smell is as strong as the vinegar smell or stronger, strain it into a spray bottle and you have a lovely strong all purpose cleaner! And no waste! Thank you for the orange all purpose cleaner recipe,last year we & everyone was plagued with Asian beetles/Lady bugs . I read recently they hater the smell of citrus .I am going try this . Even thru the winter months in Canada they appear ,I have had one bite on my head & has taken a long time to heal. This is an excellent idea. I am allergic to most fresh fruits, but can usually eat them when they have been cooked or canned. I never get to have oranges. I am going to try this while I can still get them inexpensively. Thanks for this. 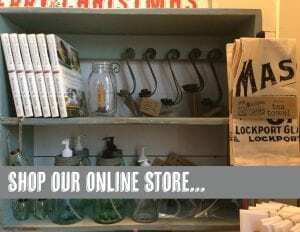 Thank-you for the lovely canning directions! 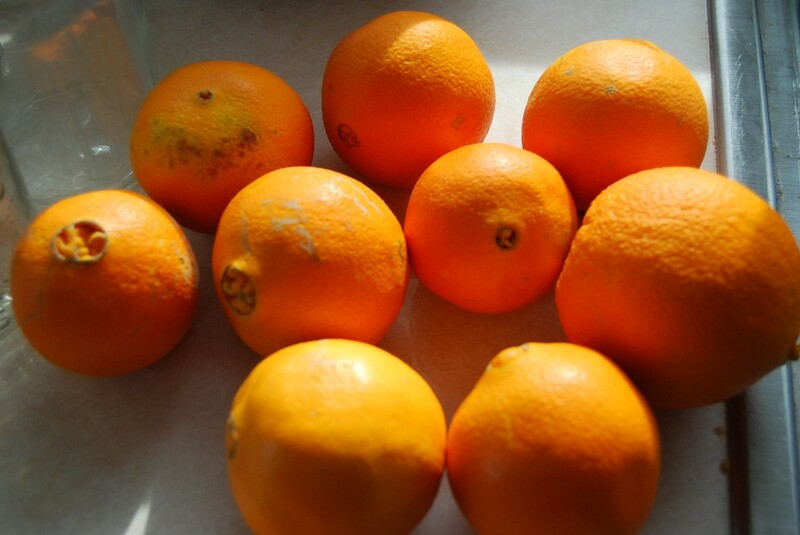 I bought FFA oranges at Christmas … so many oranges and my husband thought they were sour. I did not want to waste them or make a sugary preserve. Works! 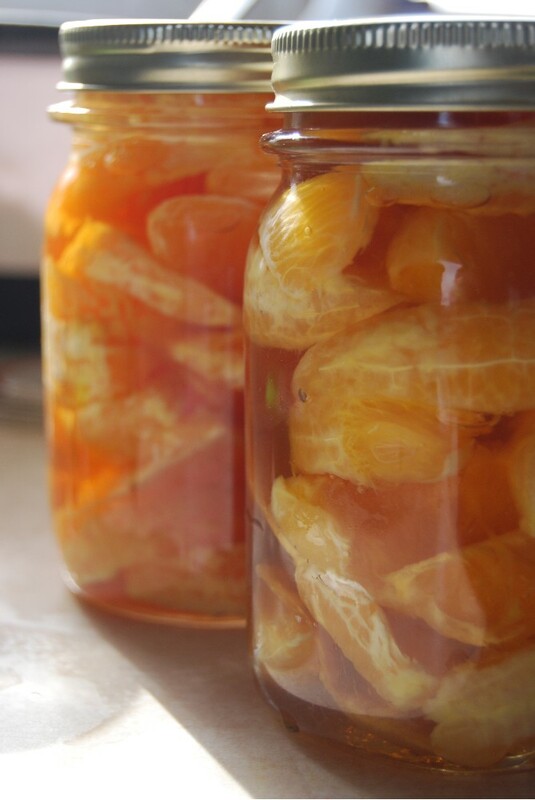 Take your orange peels and pack them loosely into a quart jar. 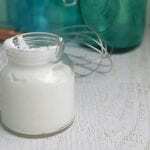 Fill the jar with white vinegar and screw on a lid. Let sit for 10 days. 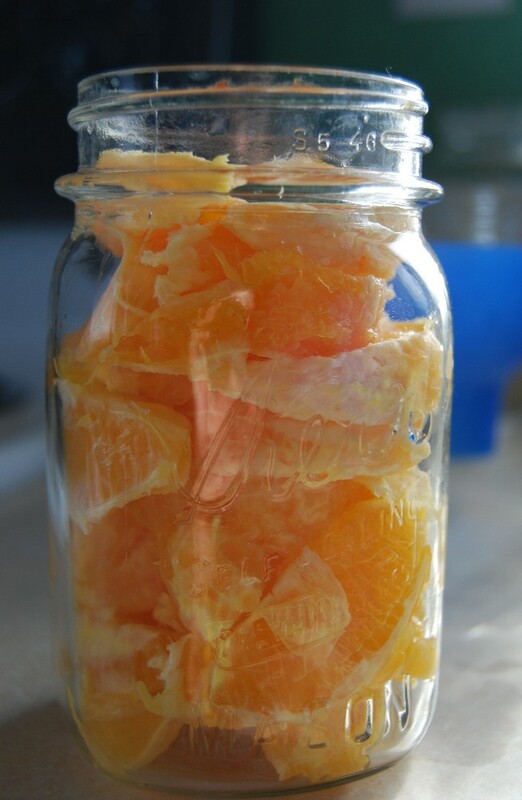 Strain out the orange peels (I used cheap muslin fabric) and put the remaining liquid in a clean spray bottle. It cleans just about everything and leaves a fresh, clean scent behind. And it’s inexpensive to boot. 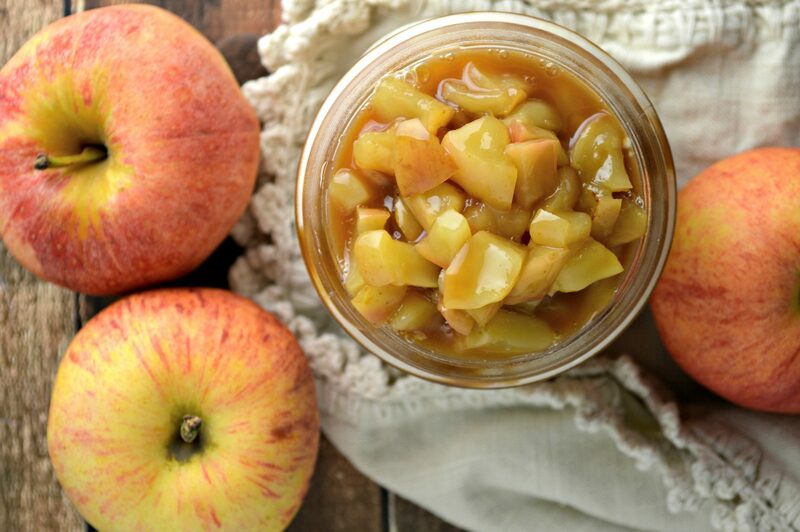 Do you add any water to that or just straight vinegar? What can you use that solution on? 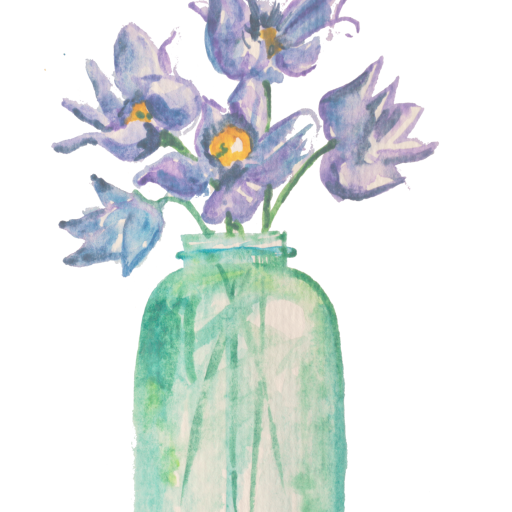 I LOVE this cleaner….it’s all I use! I loved canning oranges so easy.My only problem is they bitter is there something I did wrong ?? You want to try and get off as much of the membrane as possible otherwise they do tend to get bitter. My oranges are looking a little cloudy is that normal? The seals are all still good and I used your instructions up above. How long has it been since you canned them? Are they too cold? Do they smell funny when you open them up? Hello, i was just wondering once the oranges are canned how long can they store for roughly? My rule with canned goods is to not store longer than 2 to 3 years. Is it necessary to remove seeds before canning? Would seeds make the canned oranges bitter?